Field research into why yellow-cedar trees are dying and how people dependent on it are coping with a changing environment. 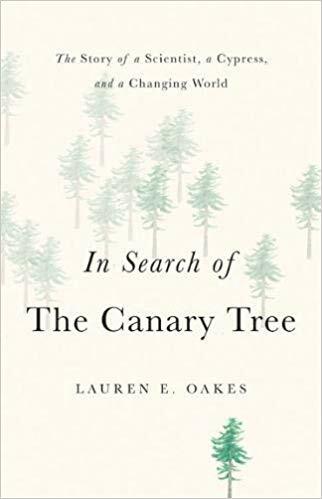 In Search of the Canary Tree begins in 2010, with Oakes searching for a topic for her Ph.D. research in Alaska. She interviews local scientists, forest service employees, and park rangers about their research and how she might be able to contribute ... Oakes has few preconceptions about where her research will lead and is willing to be surprised. She’s surprised by what she finds in her ecological studies of yellow-cedar stands and by what she learns from the people she interviews. True, there is an attendant grief, given the grim nature of her research, but there is also hope for the future. This unique title chronicles an ecologist’s work tracking the impact of climate change on the yellow cedar, a tree that once thrived in the old-growth forests of Southeast Alaska. Avoiding an academic tone, Oakes infuses this chronicle with moments from her own life, including her uncertainty as a graduate student at Stanford seeking a research topic and the devastating shock of her father’s death ... Oakes has special appeal as a compelling new voice in science writing, and readers interested in trees, forests, ecology, and environmental issues will enjoy her intriguing work. What did you think of In Search of the Canary Tree?